This photo was taken on July 19, 2017 at 6:50 AM. The location was the front walk in front of my home in Bethesda, Maryland. The "Take It!" came from seeing the skill level of the home delivery fellow that brings all three of the home delivered papers to my house. I have actually met him - early one morning as he was on his route in front of my house. A very nice fellow who just happens to have a very good arm and is able to on occasion get all three papers almost into one of the marked sections in the sidewalk. On this particular morning - he missed a perfect score - by not very much as the tail of one of the papers was outside the zone and on the lawn by just a little bit. 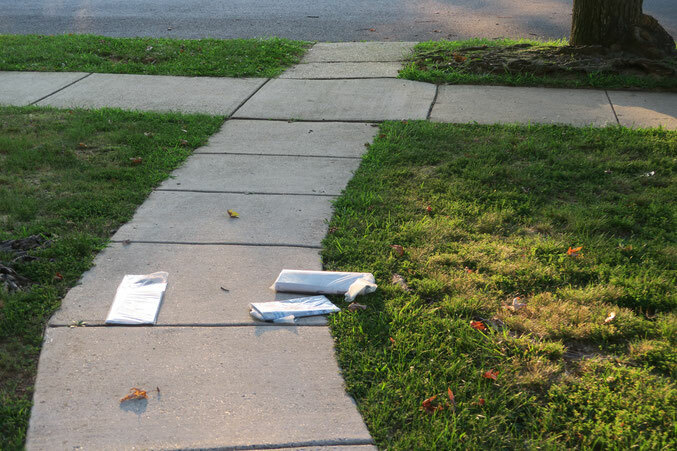 The After Take: If and when he gets all three papers completely within one of the squares on the sidewalk - I will give him five dollars the next time I see him. I have a feeling he will be quite surprised as he is playing in a game he does not know he is even in - lol. Fun surprises can be oh, so good. I encourage you to find a game to play of your own with someone who will get a big dash of pleasure in finding out, that you are playing it - and it is with them.